Great 14k white gold diamond and black onyx ring. 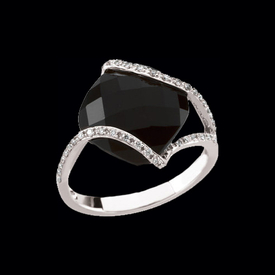 Genuine onyx is a large 7.56carat stone that measures 12 mm x 12mm and is a cushion lozenge checkerboard. Diamonds surround the large onyx and total 1/5ct tw. Fancy Onyx Gold Ring. Pretty 14k Yellow gold Onyx ring. 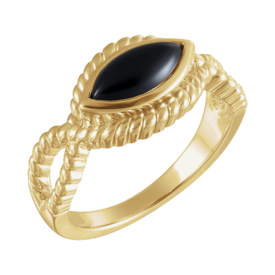 Rope design 14k gold hold a Marquise shape genuine Onyx that measures 10x5mm. Stock size 6. Pretty 14k Yellow gold genuine cabochon marquise shaped Onyx ring. Onyx measures a big 12x6mm.